Surely others know him. He mocks us as we turn upon our beds. He scoffs at us as we wriggle and squirm into our preferred positions, seeking to close our eyes. Perhaps we fluff our pillows or sip some water. We may arise and check the blinds, making sure they’re drawn, that the doors are locked, and then lie down again. Perhaps we look at our spouse and/or children with envy, as they rest, seemingly untroubled. But we wrestle on…against our mocking foe: sleeplessness. Tonight was such a night. Why? Perhaps it was because my father-in-law is slated for surgery today. Perhaps it was because our college-aged daughter came home last night to accompany her mom to Papa’s surgery later today, as I stay home with our son. Perhaps it was because I was so thankful to see our daughter home, even under the serious family circumstances, that I could not rest. Perhaps it was because God wants me to listen to him. When even the cicadas and frogs have fallen silent, I can listen without disturbance. In Hemingway’s short story, “A Clean Well-Lighted Place,” an older experienced waiter and a young restless waiter discuss an old man who is sitting and drinking brandy alone in their café, late in the night. The older waiter respects the old man, and seems to have a spiritual kinship with him. However, the young waiter is hurried, impatient, and feels the old man is a nuisance. The young waiter wants only to close the cafe for the night, so that he can go home to his young wife. But the old man remains in the café. He likes to sit in this particular cafe late at night where he can imbibe, not just brandy, but the night’s simple beauties. He takes note of the shadow of leaves in the electric light, and of how clean this café is. He notices a soldier and girl, as they walk by in the street. The light reflects off the brass number on the soldier’s uniform. Details sparkle in the night when the pace of the day has slowed. The combination of light, some brandy, and cleanliness create a sanctuary for the old man, in his world that is otherwise a world of nothingness—the operative theme in this Hemingway story. Nothing as a cause? Yes. Why? Because man cannot truly live if his belief system is anchored in nothingness. Philosophically speaking, this is the worldview of nihilism. “He has plenty of money,” one waiter quipped. So fiscal poverty couldn’t be the cause of the old man’s despair. The assumption made is clear. Since the old man has enough money, then despair, that nagging sense of lostness, of nothingness, should not plague the old man. But it does. He’s in spiritual poverty. And so he comes out to cafes late at night, alone, and drinks brandy to dull his despair in order to endure. The assumption by the young waiter is that if one has a good work/career, a loving spouse, and money, he/she should be fulfilled. In the words of the young waiter, one must only have “confidence.” Speaking of himself, the young waiter boasts, “I have confidence. I am all confidence.” Pity this man; he’s a shell. This is how masterful Hemingway is. Look at that word carefully. Confidence. It denotes the feeling or belief that one can accomplish something, that success is just around the corner. What’s the root? Confide. It denotes the entrusting of something valuable to someone for safekeeping. And there’s the irony that’s crucial to think through in this story. The older waiter understands the reason for his spiritual kinship to the old man sitting alone in the café, sipping his brandy. Both the old man and the old waiter have lived enough to have lost it all; they’ve experienced the nothingness that life can bring, if it’s lived only in artificial light. Solomon’s perennial lessons from Ecclesiastes are dangerous if taken in isolation: “And I commend joy, for man has no good thing under the sun but to eat and drink and be joyful, for this will go with him in his toil through the days of his life that God has given him under the sun” (8:15 ESV). It’s vital to read the whole context, because if we don’t understand the overarching story of God behind the existential momentary joys, we are spiritual amputees, like the old waiter and the old man. They both are seeking light in the night–just a simple café, with clean tables and polished wood and decent brandy. The young waiter is likewise lost, but he’s still so immature, that he’s “all confidence.” He’s just a younger version of the lostness of each man in the story. Why do the old waiter and the old man suffer alone? Because they’re cut off from the confidence the young waiter has, the sense of having life by the tail. They understand lostness, the sense of seeking light and beauty in a world devoid of God. That light, however, was absent for them because, in Hemingway’s worldview, God was absent. 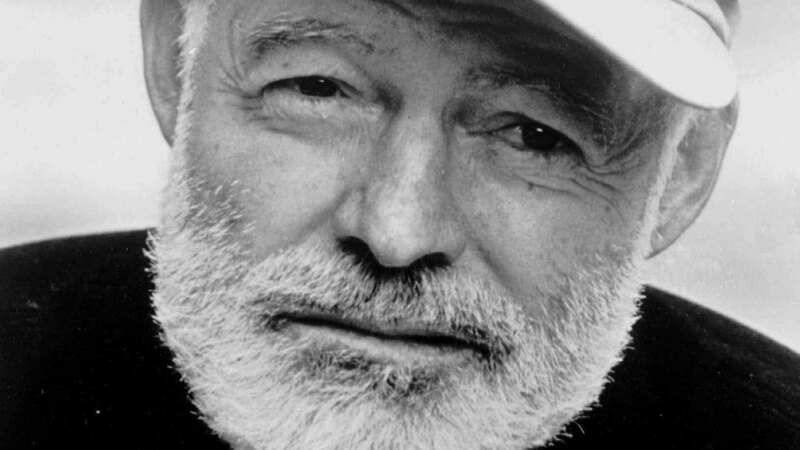 When God is absent, Hemingway had the intellectual honesty to admit, despair and nihilism result. He, like his characters, wanted to entrust his soul, to another. He wanted to confide. He longed for a spiritual confidant. Like the old man drinking brandy late at night alone at the café, Hemingway, too, attempted suicide. But Hemingway’s own end differed in one significant detail. Hemingway’s suicide was actualized. He blew his brains out with a double-barrel shotgun. The old waiter and the old man had lost almost all hope. And the young waiter’s hope was misplaced. All three men were near to light, but shut it out. Could it be because the true light had come into the world but they preferred darkness (John 3:20)? Could it be that when anyone suppresses the light of God, he/she invariably substitutes other lights—well-lighted cafés, brandy, or activities/busyness? The young waiter assumes his busyness, his wife, and his activity will stand him in good stead. But the older waiter and the old man share some sad wisdom. Life’s not that neat. The two older men know what happens when those things are taken away. One is left exposed before God. But for Hemingway, as for these men in the story, God was absent. I’ve read Hemingway deeply for two and half decades now, and I’m continually astounded by his giftedness in evoking catharsis—the pathos engendered by such a masterful writer, where our souls are knit with characters to such a degree that our life experience is deepened. However, I wonder what it would have taken for him to acknowledge that we are always exposed before God. 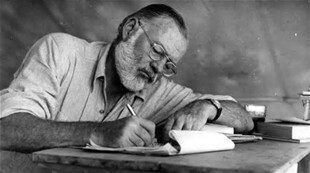 The Bible served Hemingway for more than a few of his titles of his novels and stories (The Sun Also Rises title comes from Ecclesiastes 1:5, and the Lord’s Prayer, found in Matthew 6:9-13, is mocked in “A Clean Well-Lighted Place”). In Hebrews 4:13, Scripture records this promise from God: “And no creature is hidden from his [God’s] sight, but all are naked and exposed to the eyes of him to whom we must give account” (ESV). Often in Hemingway’s writing, the reason we come across men like these, men who are alone, in despair, and teetering over the spiritual chasm, is because they’ve cut themselves off from the author of rest. Perhaps sleeplessness can be a gift to draw those who will listen to the God who grants rest, a Sabbath rest, for those who’ll seek refuge in him. He even calls himself the light. Such light, one might dare to say, outshines even a well-lighted café.